Or, quote lines from "Raiders of the Lost Ark" as you tour the nearby Huleia National Wildlife Refuge, where the scene was shot. The water at nearby Kalapaki Beach is typically calm enough for kids, plus there's a place to rent beach chairs and surf/paddle boards. Only this home overlooks the Pacific. Spectacular ocean views from every rental. Grab an open poolside grill and go for it. Then bring it back to your private lanai and dig in. 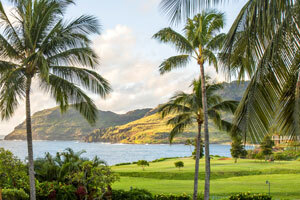 You're right next door to Wailua Golf Course. The most noise you'll hear are the sounds of the rainforest and ocean waves. You're nestled in a lush tropical rainforest above miles of white sand beaches. Castle Kaha Lani, A Condominium Resort’s lush tropical rainforest setting is tucked between miles of white-sand beaches and acres of green fairways, perfect for a peaceful and quiet vacation. Golf clubs are a must-bring, with over ten courses nearby, including Wailua Golf Course next door and Kauai Lagoon Golf Club, home to two Jack Nicklaus-designed courses. Go for a swim in the outdoor heated pool or grab a lounge chair and relax with a good book while the kids splash around. When it’s time for lunch, take advantage of the poolside BBQ grills for a cookout. Recruit the little ones to assist with carrying burgers, hot dogs, and condiments. Break up your leisurely pool time with an hour on the tennis courts or putting green. Individually furnished and decorated one- and two-bedroom condos sleep four to six guests. All condos treat you to stunning panoramas over the water; no up-charge for ocean or oceanfront views here. Condos offer plenty of space for hanging out, and full kitchens make top-your-own-taco nights a breeze (don’t worry if the kids end up covered in taco fixings; there’s an on-site laundry facility). Make it dinner and a movie thanks to flat screen TVs with cable and DVD players; be sure to pack favorites from home. Beach fans will want to head straight for Kalapaki, where the calm waters are perfect for swimming. Or park yourself under an umbrella and get lost in a great beach read. Castle Kaha Lani is a short walk to Lydgate Beach Park, perfect for snorkeling. If you’re up even more beach fun, check out Wailua Beach. It’s just a short drive from the resort. Shopaholics will love the unique boutiques and shops at Coconut Marketplace. The ABC Store has sundries, coffee, apparel, and accessories. If you’re looking for a special gift or a souvenir, check out Hawaiian Music Store, Auntie Lynda’s Treasures or Del Sol Hawaii. Apparel can be found at Suzi’s Young Fashion, By the Sea and Crazy Shirts. Hungry? Bobby V’s Italian Restaurant Pizzeria has you covered. Spend the day exploring a nearby town – you’re just minutes from the center of Lihue. While modern-day Lihue acts as the island's commercial center, it's also home to historical sites like the Kilohana Plantation and 1,000-year-old Alekoko Fishpond.